THE AIRTURBO, ORIGINALLY USED TO MEET THE RIGOROUS REQUIREMENTS OF UNDERGROUND EXPLOSION PROOF LIGHTING FOR COAL MINES, IS BASEEFA CERTIFIED FOR USE IN ZONES 1 AND 2 INDUSTRIAL HAZARDOUS AREAS, TYPICALLY IN OIL AND PETROCHEMICALS INDUSTRIES FOR TANK CLEANING AND PIPELINE INSPECTIONS. 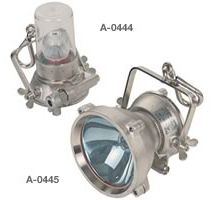 Once connected to a suitable air supply, continuous output of high quality general illumination is produced, even under water. The A-0444 is fitted with a bay light type head providing all round illumination when suspended in the work area and the moulded ball glass containing the bulb is surrounded by a protective polycarbonate dome. The A-0445 provides a flood beam giving a well diffused 30° angle of light with the standard matt reflector, or with a polished reflector, a highly concentrated spot light. The lamp has a 15mm toughened glass lens for high impact strength and pressure resistance. Housings are spark free cast brass with a forged brass safety hook, all nickel-plated. The generator is a compressed air driven turbo-alternator of simple design and robust construction and a gunmetal impulse turbine wheel produces the energy to power the 12v 55w Tungsten Halogen bulb. A clean dry air supply is a condition of certification and essential for the efficient running of these lamps. Deposits of dirt on the inside of the lens will adversely affect the level of illumination and if needed, air-line filters can be supplied. Another mandatory requirement of safe use is anti-static hose, designed to avoid a dangerous build up of static electricity. The Airturbo has many inherent safety features, recognised by BASEEFA; effectively pressurised and purged system, protective curtain of air from the exhaust ports, instant cut-off of the lamp if the lens is broken and cooling of heat generating components. 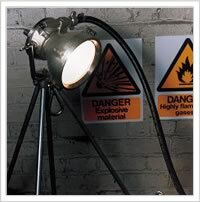 Lamps are routinely run in, tested and set to the necessary output prior to despatch. A clean, dry air supply must be used. Supply hose must be anti-static.